Even though I’m (long) out of school and no longer required to face the terror of teenage dance-angst, I still watch Carrie about twice a year. 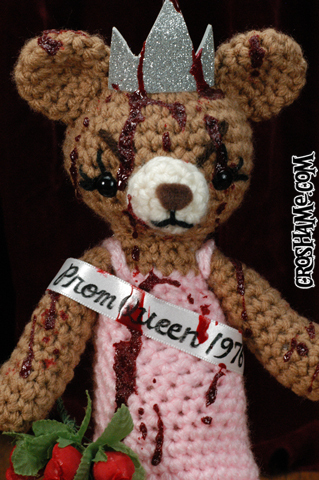 On my last viewing, as the school gymnasium burst into flames and various high school students were either burnt to a crisp, crushed or drowned, I knew it was that time again — time to crochet a horror movie tribute! 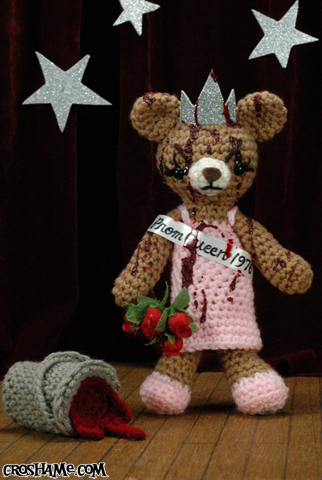 Carrie Bear comes with her own sash, rose bouquet, and bucket of spilled pig’s blood; she’s ready to come home with you and telekinetically set fire to your heart. Available now at the Croshame Etsy store! 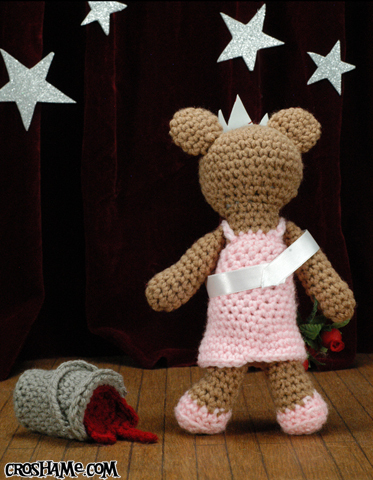 This entry was posted on March 19, 2012 by croshame. It was filed under Antigurumi, Etsy Store .